Considering Lata Mangeshkar's long reign at the top, it should come as no surprise that she has sung duets with almost every top singer, male or female. Since my choice of her solos were (mostly) sad numbers, I decided that her duets had to be either the sparkling, foot-tapping numbers or the quietly romantic ones. I didn't want any of the tragic duets, and that self-imposed restraint meant that some of my favourite duets had no place in this list. As with her solo numbers, it is difficult for me to choose a handful of her duets. To make it easier, or so I thought, I decided to restrict myself to one duet per co-singer. That, in itself, turned out to be a Herculean ordeal. 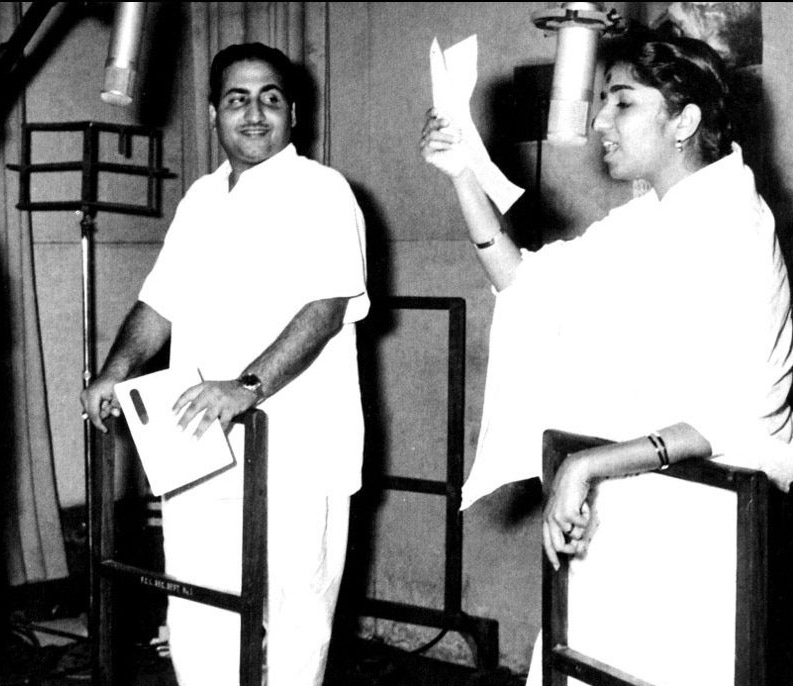 How do I choose one song from Lata's duets with Mohammed Rafi, for instance? I consoled myself with the thought that future lists could take care of that problem. Here, in no particular order, are my picks from her duets. Salilda once said of Hemant Kumar that if God could sing, it would be in Hemant Kumar's voice. His voice was redolent of lazy afternoons on river banks, deep passion, and the melody of Bengal. This, one of Kalyanji's solo compositions (before he became part of the Kalyanji-Anandji duo), is a beautiful, yet lesser known duet sung by the two stalwarts, and closely edged out my usual favourite Yaad kiya dil ne kahan ho tum from Patita, and the melodious Saanwli saloni aaye din bahaar ke from Ek Hi Raasta. Neend na mujhko aaye combines Hemantda's deep voice with Lata's sweetness to bring romance alive. Lata had a humorous story to narrate about her recordings with Hemant Kumar. He was so much taller, and she often had to stand on a box to record duets with him. Chhupa lun dil mein from Mamta and Tumhe yaad hoga from Satta Bazaar are other Hemant-Lata duets that will always be among my favourites, but did not make the cut due to my restriction on sad songs. This is an unusual composition in that it is one of the few songs (perhaps the only one?) where the male voice joins in so casually mid-way through a verse. Picturised on Nutan, of whom Lata once said that she was the only heroine who looked like she was actually singing on screen, and Dev Anand, it is one of the best of Lata-Chitalkar duets. Once C Ramchandra heard Lata's voice, it was as if no other singer existed - all his songs were composed with Lata in mind. So besotted was he that when they had a falling out years later, his career too suffered. He could not think of a female singer beyond Lata. This, despite the fact that he had used Shamshad Begum quite effectively before he became a Lata loyalist. Kitna haseen hai mausam from Azaad was on my shortlist as well; a frothy melodious composition reminiscent of OP Nayyar's taanga beat, it was originally composed for Talat Mahmood. When he couldn't make the recording, Chitalkar took over, simulating Talat's honey-smooth vocals well enough to defy notice at first listening. If Lata Mangeshkar was the undisputed queen of melody, then there was a period where, even with peers like Talat Mahmood and Mukesh carving out their own niche in playback singing, Mohammed Rafi left his imprint on Hindi film music as a versatile singer, and a good human being. I like different songs by different singers at different times, but if I were pushed to pick my 'favourite' male singer, it would have to be Mohammed Rafi. To pick one song from the innumerable duets that Rafisaab sang with Lata is, as I said before, almost impossible, but there is something sweet about this song from Love Marriage. While Dev Anand had Talat Mahmood, and later Kishore Kumar lend him their voices, it is my personal opinion that Mohammed Rafi suited him better than the others. Two other songs that I listed, but which lost out to Dheere dheere chal in the final reckoning are Do sitaron zameen par from Kohinoor, and the softly romantic Meri duniya mein from Heer Ranjha. 'Singers like Mohammed Rafi aren't born every day', is what Lata had to say about the colleague with whom she sang the maximum number of duets. It is unfortunate then, that the two had a falling out over the issue of royalties that saw three years pass before peace was brokered. This song is from a later period than I usually list - the 70s. However, with the exception of a few duets with Lata during the golden period of the 50s (Their first recorded duet was Ye kaun aaya re karke solah singaar from Ziddi in 1949), it was in the 60s that Kishore and Lata began their collaboration anew. If father SD Burman gave the duo some of their best known duets (take a look at the sensuousness of Uff kitni thandi hai ye rut from Teen Deviyaan) then the son wasn't too far behind, weaving magic with this romantic number. Kishore's deep voice matches the sweetness in Lata's; the playfulness at the beginning giving way to a quieter, and deeper emotion. Another RD composition that has always been among my favourites is Tere bina zindagi se koi from Aandhi (1975), but the sheer intensity of pain that underlies the song made me regretfully abandon it in favour of romance. A close competitor was Woh ik nigaah kya mili from Half-Ticket (1962), if only to showcase Lata's vocals. This Salil Choudhary composition had her trill like a bird in the high octaves, to a point where one is hard put to distinguish the flute from her voice. Manna Dey sang more duets with Lata Mangeshkar than he has with anyone else (about 113 of them). He once confessed that when he recorded with her, he often forgot his lines, so stunned was he by her virtuosity and expertise. 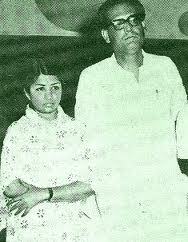 Lata Mangeshkar first met Manna Dey at composer Anil Biswas' house. Soon after, Anil Biswas summoned him record a classical duet with Lata for Humdard (1953). A complex song based on multiple ragas (Gaud Sarang, Gaud Malhar, Jogiya and Bahaar), Manna Dey rehearsed for a week, and was finally ready to record when Lata was called to rehearse. He was taken aback when Lata learnt the song in a single day. In the film, the hero was teaching the heroine to sing. When they finally recorded the song, Manna Dey felt that it sounded as if the heroine was teaching the hero how to sing. According to Lata, however, Manna Dey always helped her while singing classical songs. While Masti bhara hai sama from Parvarish and Dharti kahe pukaar ke from Do Bigha Zameen are two of my favourite Lata-Manna Dey duets (apart from the ones in Chori Chori), I chose Preetam daras dikhao because it is one of their lesser known collaborations. A beautiful Madan Mohan composition, it is based on Raag Lalit. Bonus: Here is a clip where you can hear Manna Dey on Lata Mangeshkar. If Madan Mohan had a well-deserved reputation as the king of ghazals, then Talat Mahmood was definitely not far behind. In fact, before he began his career in films, Talat Mahmood was already famous - his ghazals were played regularly on AIR. The duo were however not constrained by that reputation to stick to only ghazals. This is a lighter romantic song, and showcases the rapport that the unassuming Talat shared with Lata Mangeshkar. I had two other songs shortlisted, each as different from the other, as they are from this, my final choice. They are Seene mein sulagte hai armaan from Tarana, composed by Anil Biswas, Talat's mentor, and Dil mein sama gaye sajan from Sangdil, composed by Sajjad Hussein. Talat Mahmood first met Lata Mangeshkar during the recording of a duet for Anmol Ratan (1950). (The song was Shikwa tera main gaoon.) His soft voice, excellent intonation and diction had already earned him fame in Calcutta. 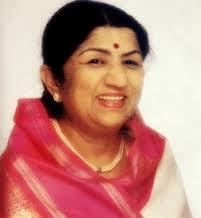 Lata and he shared a warm friendship and they collaborated on more than sixty duets during the course of their careers. The last duet they sang together was Jahan Ara (1964) - Ae sanam aaj ye kasam khaaye. 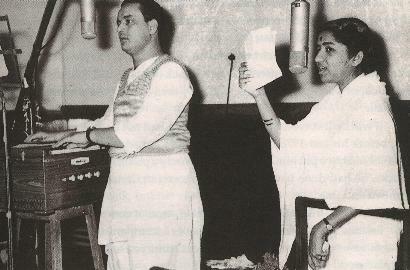 Lata Mangeshkar and Mukesh first met during the recording of Ab darne ki koi baat nahin (Majboor/1948). Majboor was Lata's big break, and one that she was quick to take advantage of. She and Mukesh had a long association, a relationship of love and respect on both sides. They also had something else other than their music in common - their admiration for KL Saigal. In fact, their bonds deepened so much that when Mukesh produced Malhar (1951) and Anuraag (1956), Lata was the obvious choice to playback for the heroine. He even composed the music for the latter film. Other song choices were the sweetly romantic Bade armanon se rakha hai balma teri kasam from Malhar (Roshan), and the mischievous Jaane na nazar pehchaane jigar from Aah (Shankar-Jaikishen). They are all fine songs, but my final choice was for two reasons: Mukesh was known as Raj Kapoor's voice, not Dilip's. (He preferred Talat Mahmood or Mohammed Rafi to playback for him.) Secondly, I wanted to use a music director other than Shankar-Jaikishen, simply because they were the music directors who composed the bulk of the songs that these two legendary singers sang together. 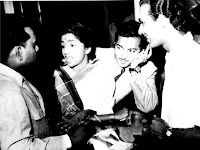 In Conversations..., Lata shares anecdotes of how it was to work with Mukesh; if, while they were recording, a musician played a solo piece off-key, Mukesh would turn around and ask, "Who is copying me?" He was also very amused during the recording of Sawan ka mahina from Milan because he was supposed to be teaching Lata to sing. As far as I can gather, the first duet that Lata Mangeshkar sang with Mahendra Kapoor was Tere pyar ka aasra chaahta hoon from Dhool ka Phool (1959) under N Dutta's baton. 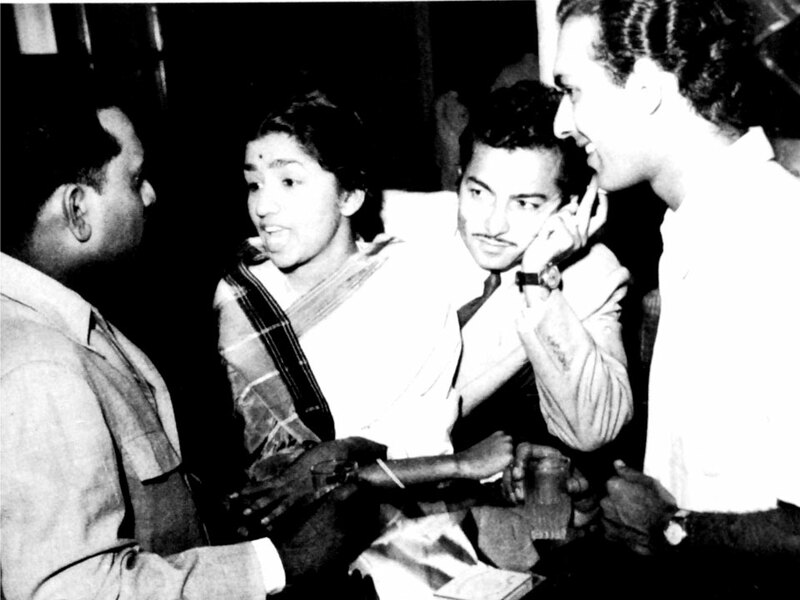 From then, until 1964, there was the odd song here and there, Lata's duets coming with the other four top male singers. That year saw them record five duets (Ishara, Majboor, Mera Qasoor Kya Hai?, and Woh Kaun Thi?) and one 'trio' (Har dil jo pyar karega) in Sangam (Mahendra Kapoor lent his voice to Rajendra Kumar). It was a collaboration that was to see over 70 duets recorded over the next couple of decades. It is interesting that I should have chosen a song that was composed by Ravi - according to Mahendra Kapoor, nobody understood or made use of his calibre the way Ravi did. I like it not only for its tripping melody, but also for its picturisation. There is an innocence, a sweetness about the picturisation that was complemented the voices behind the screen. My other choice was Chitragupt's Zara sambhaliye from Bada Admi. Mahendra Kapoor's first recording was for Navrang (1958) - Aadha hai chandrama raat aadhi with Asha Bhosle. This was one of C Ramchandra's best scores in his post-Lata days. The self-confessed Rafi-bhakt came into films at a time when Mohammed Rafi, Talat Mahmood, Mukesh and Manna Dey had already etched their names into the history of film music. Yet he managed to hold his own, carving out a career that spanned 4 decades. Lata Mangeshkar first met Geeta Dutt for the recording of Jawani ki rail chali jaaye re for Shehnai (1947) under C Ramchandra's baton. That song was a trio with Chitalkar, and the beginning of their collaboration that was to last for over twenty years. Strangely enough, over the period of three decades, they have barely sung a handful of true duets, though they have collaborated on a few other songs with other singers. Akhiyaan bhool gayi hai sona was their last true duet (they did sing other songs together, but with other singers). Geeta's mischievous adas in this song were unmatched; Lata had the sweet straight lines to sing. Bechain dil khoi si nazar from Yahudi (1958) under Shankar-Jaikishen's baton and Chedoji aaj koi pyar ka tarana from a relatively obscure Son of Sinbad (1958) were other songs that were on my shortlist. Geeta Dutt and Lata Mangeshkar shared a warm relationship even as they became professional rivals. But Geeta Roy (as she was then) was probably the only female singer of the time who managed to hold her own against the tidal wave that was Lata. After all, she had reinvented herself with Tadbeer se bigdi hui from Baazi (1951) even though Lata had blitzed her way into the top league with four releases in 1949 - Mahal, Barsaat, Dulari and Andaz. Between them, they ruled the world of playback singing in Hindi films, much to the detriment of other singers - or so it is said. Most of the duets had Lata singing for the heroine while Asha had to be content singing for the second lead. The sisters' first duet was Ye ruki ruki hawaayein for Daaman (1951). Funnily enough, they only sang around 75 duets together in their long careers. The reason for this is equally intriguing. I recollect reading somewhere that while Lata held her notebook in her right hand, Asha held it in her left, thus leaving the two no way of anticipating each other when singing. Which, on the face of it, seems to be a silly reason to not sing together. Sakhi ri sun is a semi-classical number, and one where I personally think Asha has matched her elder sister verse for verse. It is certainly a flawless performance. As usual, Lata sang for the heroine (Meena Kumari) while Asha provided the playback for Meenakshi, who plays her student. My personal choice was Meha aayo re from Sangeet Samrat Tansen (1962), a wonderful classical composition by SN Tripathi; unfortunately, it also had a few lines by Manna Dey, and is therefore, not strictly a duet. The YouTube clip is also not complete. The full song is almost 6½ minutes long. Two other duets on my short list were Manbhavan ke ghar jaaye gori from Chori Chori (Shankar-Jaikishen) and the soft, sensuous Man kyun behka from Utsav (Laxmikant-Pyarelal). I know, I know, I gave in and chose the most obvious choice. I couldn't help it; this is one of my favourite songs, if only for the different perspectives. It is a song that foreshadows what Nadira/Anarkali's future will be when she loses her heart to the prince. Naushad colours Shakeel's lyrics with music that rises and falls in tandem to compose a quawaali that will stand comparison to the best of the genre. Lata had this to say of (and to) Shamshad Begum: No one has seen the kind of stardom and respect that you did. Lata sang barely 28 duets with Shamshad Begum; coincidentally, Lata had once won a competition in Pune in 1941 by singing Shamshad Begum's songs from Khazanchi. The two of them first sang together for C Ramchandra for Khidki, but it was Naushad who gave them some of their most popular songs, in films like Andaz, Babul, etc. I did dither over choosing Bachpan ke din from Deedar or Kisi ke dil mein rehna tha from Babul, but the latter one was depressing, and as I said, I didn't want weepy songs in this list. Lata and Suraiya sang only five duets together. Two for Balam, and one each for Shokhiyan, Sanam and Deewana. I had a tough time deciding between this, and their other duet Duniyawalon mujhe batao from the same film. The latter is a 'lighter' song, where the heroine (Suraiya) and her friend (Nigar Sultana) debate the definition of true love. Suraiya, obviously, sang for herself. Then I went back to this, though there is no video available for the song itself because there was something endearing about this song. Suraiya was honest enough, and graceful enough to confess that she had not an iota of Lata's talent. She said "Noor Jehan was born great, Lata achieved greatness and I had (singing) greatness thrust upon me." This song was their first duet together, and she was so spellbound when Lata sang her first line that she forgot her cue. She said she knew then that she was miles behind Lata in terms of talent. She also credits music director duo Husnlal-Bhagatram for 'training' Lata. Lata, on her part, remembers a simple and strikingly beautiful actress who had absolutely no airs, her stardom and perhaps more importantly, her warmth and laughter. These are some of Lata's duets with the top singers, both male and female, of the decades from the 40s through the 60s. Besides these, she has obviously sung with many other singers like Subir Sen, Dwijen Mukherjee, Bhupinder, Rajkumari, Suman Kalyanpur, Kamal Barot, Amirbai Karnataki, Usha and Meena Mangeshkar to singers who were not even born when Lata began her career. She has sung for music directors, spanning generations, fathers and sons (SD Burman/RD Burman, Chitragupt/Anand-Milind, Sardar Malik/Anu Malik, Roshan/Rajesh Roshan) - whatever our opinion of the quality of her voice now, no one can deny that when posterity looks back upon the history of Hindi film music, Lata Mangeshkar's name will be one of its brightest. What are your favourite duets? Hats off to the effort you put in writing these posts. Each song is a gem and because you decided to choose one song per co-singer, we got to hear songs which we would not have had an opportunity to hear if it was just a regular Lata top-10 duets. This time, I read the post twice before posting comment. I would never dare to such post, as I would never be able to decide what to leave(and what to choose). For all your efforts and because its Lata Ji, I give you my chosen 11 songs. These are definitely not amongst the best or the most popular Lata duets but just some songs from my childhood days of growing up at my grand mum`s place. Thanks to you-tube I now know what movie they are from or who are the performers on screen. They are all from black and white movies, all fun/romantic songs and the one song per co-singer. My list has 11 songs because the song with Suraiya has already been mentioned by you. Mohammad Rafi in the company, too. Mila – Tower House – 1962 – Ravi - http://youtu.be/X4Q1SbYpMIo ,too. - a song picturised on Nutan, as one of the protagonists. Ohhhh! What can I say about this post? You have chosen happy, delightful songs - wonderful! You chose songs I knew - excellent! You brought a big smile to my face as I went down the list and hummed both the songs chosen by you and the runners-up/discards - what else could I ask for at the start of a day? Thanks, thanks, thanks! I have to go and see my favorite person now - the dentist, and if I am dead after that, at least I will have died happy! If I am still alive, I will come back, listen to the songs one by one, and then post some thoughts of my own. Anu, I am all admiration for you. You manage to write posts that are so informative and so entertaining! Coming from you, Madhu, that made my day! Thank you! I agree about the difficulty of choosing just ten (duets or solos) from the greats, but these are songs that would be on some favourite list of mine - at some point or the other. Halke halke chalo saanwre is a wonderful, wonderful, song. Quite one of my favourites. Thank you for bringing that back to mind. I prefer Lata's solo version of Dil ke girah khol do to the duet; no particular reason. Thank you, Nra. :) And, oh, I had much heartache over what to leave out too. I think I now have plenty of material to write posts on Lata-Rafi, Lata-Asha..... duets! 1. Lata-Hemant - I *love* Jhir jhir jhir jhir badarwa barse... I truly think it *is* one of their best. 2. Lata-Chitalkar - thank you, thank you, thank you! I had heard Woh humse chhup hain a long time ago, had forgotten it, and now you have refreshed my memory. The bonus (to me) is that I didn't know it was picturised on Raj Kapoor! Thank you so much! 3. Lata-Rafi - Aaj mausam ki masti mein is beautiful! One of their rarer duets, and one of my favourites too. 5. Lata-Mahendra Kapoor - I haven't heard Chori ho gayi raat before. I have to listen to it more carefully before I can comment. 6. Lata-Manna Dey - How can I not like the combination of Lata-Manna Dey and Shammi Kapoor? Jhoomta mausam mast mahina is so, so ebullient! Love the song. 7. Lata-Talat - Ah ha rhim jhim ke ye pyaare pyaare would make my list anytime I make a 'favourite Lata-Talat duets' post. 8. Lata-Mukesh - *grin* I have Bade armanon se rakha hai balam teri kasam listed up there, as one of the songs I shortlisted. 9. Lata-Geeta - Man mor machwa shor is so quietly beautiful! It is new to me, so a big 'thank you' for introducing me to it. 10. Lata-Asha - Roothi jaaye re is an unusual duet, what with Asha leading. I liked the way it started off, with the vessel becoming the drum. 11. Lata-Shamshad - Pyar ke jahan ki nirali sarkar is, to me, a quintessential C Ramchandra tune. Don't you think so? Nra, it hadn't vanished. Disqus just keeps putting arbitrary comments into the Spam folder even though I had marked my settings to 'No Moderation'; Ashokji had the same issue. I have added your names to their 'White List' whatever that is, and hope you won't have the problem again. I'm sorry. Thank you, Lalitha. I'm glad to have made you smile before you went to your dentist. :) Perhaps, when you come back from the dentist, these songs (and the alternate ones in the comments will make you forget your discomfort. Have fun at the dentist! The Rafi-Lata combination from Ek Dil Sau Afsane is new to me! And that too, picturised on Raj Kapoor! Thank you so much. Between you and Nra, you have made my day with *two* new RK songs. I loved the way this song is so quiet, yet so merry at the same time. Wonderful! Thank you! Lata-Chitalkar-Rafi - I was trying not to choose trios. Lata-Kishore: With some rare exceptions, I prefer their duets from the 60s on. I think any of their duets with the Burmans, father and son, were much better. Among the two you listed, I much prefer the song from Manmauji. Lata-Mukesh - that is a tough call. I like Mehtaab tera chehra but I think I'm going to go with Main khushnaseeb hoon simply because the other song begins so ponderously. Lata-Manna Dey - definitely the Salilda composition from Parivar. Not just because I like Salilda, but also because I think that in Jaa tose nahin boloon kanhaiyya, both Manna Dey and Lata have been fantastic in getting the notes *just* so. But I also loved Chhupa Chhupi bhag billi aayi re - it's so peppy! Thank you for that one! Lata-Geeta - Dil unse kehte darta hai - nice song... I can't see it being a favourite any time soon. Perhaps I should listen to it again. Lata-Asha - O chaand jahan tu jaaye definitely! I don't know why, but I hated the song from Mitwa. Chhoone na doongi sounded like the average S-J composition; you know, the ones they churned out without too much thought? Lata-Shamshad - it is interesting that both you and Nra picked up the same song from Patanga. :) To me, that is a standard C Ramchandra song. Lata-Suraiya - that is a nice clip you have there; it contains *all* their duets together. Thank you so much for the new additions to my list,a nd for introducing me to a couple of 'new' songs. With Talat, Itna Na Mujhse Tu Pyaar Badhaa is a favourite for the composition, the lyrics, the awfully sweet picturisation ...and did I mention lyrics ? approach lends up on what level of quality of selection. sets of options on almost on any topic that you may choose w.r.t. Lata. enjoyable, interesting and melodious fare. Some more than the others! Thank you for finding my comment(was really sad) and no you don`t need to thank me for anything. I can`t tell you what fun I get in reading and commenting on your posts. As I am not very interested in writing my own posts, your blog has arrived as a blessing for me, so my comments on your posts will never be short two liners( hope you will tolerate my indulgence:)). 4. That was a mistake((:). I was searching for the song from Ek Raaz and somehow copied the wrong youtube link. 8. That was not a mistake, just did`t wanted to break the continuity. Actually, I just don`t care for Mu kesh`s singing. It is an acquired taste for me( a taste that I never seem to acquire (like Sharda`s voice)). It maybe because, he was the popular voice for Raju and Bharat( the evil twins of Raj Kapoor and Manoj Kumar), two celluloid avatars I despise, to say the least. The only two duets of his, I actually like are "Jaane na nazar and Bade armaano se". As both of these songs were mentioned by you, so I thought of doing a Suraiyaa on Mukesh(not include him in the list). But as its Lata Ji`s birthday and the post is abt her so I couldn`t ignore her fav Mukesh Bhaiyaa. Hence, the duplicity. Lastly, my wife is NOT a Lata fan but she loves her duets with Kishore Kumar, so she forced me to mention this song which is OUR personal fav. Thanks, AKM. Yes, Itna na mujhse tu pyar badhaa *is* a favourite, but I was trying desperately not to choose the obvious (I failed in the case of Teri mehfil mein kismet). I also agree about the good post-60s songs being the exception rather than the norm. What I like most when I put up these lists, is the songs that my readers bring to my notice, and the discussions that the songs engender. They are very interesting. Anu, it is so wonderful to come back and listen to all the wonderfully happy and romantic songs that you have posted, as also those you discarded. (I confess that I have not read your post, just clicked on one song after another and listened to them with my eyes closed.) It is heavenly. Thank you so much. Nor was I attempting to put in any argument or a value judgement on the the original selection or your subsequent observations to all the comments that the articles (of yours) evoke. I was trying out put across the richness - variety , depth, range, moods, singers , music directors - that one has as the reservoir to choose from the period of pre - Mid 60s. So almost any combination or topic that is selected, the songs that one would come up would certainly be 'listenable'. What really makes the day is the selection of the topic, the way information is compiled and presented and then being vividly discussed. Ashokji, I think we are both agreeing on the same thing - the value of the post as a starting point and the discussions that follow. :) Everything is good. Hey, welcome back! How have you been? Or rather, where have you been? all great songs..you always select the gems....however Rafi and Kishore choices could have been different...Why no Rafi-Lata from Naushad...? Jhule mein Pawan ke from Baiju Bawra or Ek shanshah ne banwake hasin Tajmahal from Leader. Roshan also gave some beauties in Taj Mahal and Aarti. and since you have yourself crossed boundries by going into 70's why leave Yesudas-Aapki mehki hui(Trishul), Bhupendra - Naam Gum Jayega S.P.Balasubramanium-Hum tum dono jub mil jayenge, Manhar - Lute koi man ka nagar..all great romantic duets in my opinion. Wish to add just a couple more..
OK, that Sauternes is definitely coming up :) !!! Being chock full of details make this a truly excellent and interesting post. however Rafi and Kishore choices could have been different...Why no Rafi-Lata from Naushad...? Because these are my choices? : ) Seriously, though, there are so many even in the Lata-Rafi repertoire, for instance, that even if I were to make a favourite Lata-Rafi duet list, I would be forced to leave out so many good songs. As for Lata-Kishore, Gaata rahe mera dil has never been one of my favourite songs. I like it well enough to listen to it when it comes on, but it's not a song that I would choose to listen to. For a Yesudas-Lata duet, there are far superior numbers to the Trishul one, and while it is true I could have continued with so many other singers, this would have ceased to be a post and would become a blog in itself. I had to stop somewhere. That is why the comments section is open for my readers to list all their favourite numbers. It still will not do justice to the great body of work that is Lata Mangeshkar's. Ha, what is the use of your opening a Sauternes all by yourself? I thought you were going to visit us with bottles (in plural) of Sauternes? neend na mujhko aaye might rank as one of my fav sogns ever! Love it. Interesting that you should choose dheere dheere chal of all the songs. Wonderful choice! But I myself don't have any choice. Very difficult task! 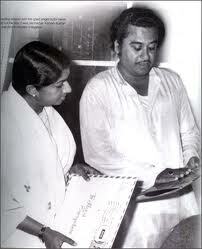 Lata-Manna fav would be one of the duets from Chori-Chori! Am surprised that you didn't choose dam bhar jo udhar munh phere, that would have been my choice or at least the first song that comes to my mind. My choice for Mahendra Kapoor-Lata would be the same as yours. Good choice for Lata-Geeta, my choice would be o gokul ke gwale from Rangeen Raatein. Luv sakhi ri sun bole papiha us paar! Lata-Shamshad duet teri mehfil is a very good one and so is the Lata-Suraiya one. Like it a lot! Very good post had fun going though it! Excellent choice of topic. My choice in some cases would have been very different, which are not mentioned in comments. These were the obcious ones. But with her huge work with every singer, I am sure for every combination there would be four or five close choices. Two duets with Rafi, not stunning musically but definitely tuneful. I remember these because of DD sundays , the first one because of the entwined swings and the second because of Meena Kumari when she sings "tumko bhi is tarah muskurana na tha"
Harvey, you never disappoint! :-) And thank you so much - I know you are very busy! Shaam dhale khidki tale *is* the obvious choice for a Chitalkar-Lata duet, isn't it? I like the song, but somehow, I tend to go in for the more melodiously romantic numbers. Perhaps that is why. I have never heard Gokul ke gwale before! Thank you for introducing me to it. I saw one of Asha Bhosle's tweets. SHE IS IN SINGAPORE. ARGH WHY DOES SHE HAVE TO BE THERE WHEN I'M NOT THERE. AK, I really like Meri chhoti si bahan, and Chhedo na meri zulfein; Thane kajaliya bana lun is a new one to me, and it's lovely - thank you for that link. I'm glad there are so many choices for her work - imagine if there were just a dozen songs that *everyone* liked! We, as listeners, would be the poorer for that. As it is, now, the comments section has already thrown up so many 'new to me' songs, and refreshed my memory on others that I love. But it is strange, isn't it, that I ended up with three Dev songs? Why don't you tweet right back at Asha Bhosle asking her to come to Florida instead? I was talking to my dad, when I saw your blog banner with Shammi's pictures, and I let out an involuntary scream of joy! Hahahahahaha! Oh, speaking of that, on Facebook, the people who run Shammi's fan club are doing this thingy of you taking a pic with one of his DVDs or posters or such. I don't have such stuff (Sad :(), but I'll be doing some photo manipulation and such with GIMP to come up with an awesome picture! Thanks, Shalini. :) Personally, I think Lalitha would have trounced me if I had picked up any more sad songs! So far, according to both Lata and Suraiya (old interviews), they sang only five duets together. If they did sing any more, I haven't been able to trace them. Ashokji posted a clip with the five I mentioned in my blog. O door she desh aa jaa re was on my shortlist along with the two songs from Balam that I listed. I dithered over them, then went with Balam because it was by Husnlal-Bhagatram. I agree with you about being underwhelmed by the Lata-Asha combo output. I think I would put my personal favourites at a dozen or so too, the four I listed being among them. I did like Dabe labon se kabhi; it is new to me, as is the Mahendra Kapoor-Lata duet you listed. The latter song is so soft, so... so quiet! Thank you for those links. Dil ki nazar se, Nain so nain milao and Jaa tose nahin bolun Kanhaiya are all favourites of mine, which lost out to the ones I eventually listed! Do sitaron ka zameen par was on my shortlist. All lovely, lovely, songs, and I must admit that I left out Jaa tose nahin bolun kanhaiya with a heavy heart. I'm so glad you listed all of these. Here is the video for the last one. Hi Anu! :D Guess what, I had my first school dance yesterday. 'Twas fun. My cousin helped me put on makeup. FOR THE FIRST TIME. It was like they were painting my face. NEVER going to curl my eyelashes again. It feels incredibly gross. And I think I have mascara still on. YUCK, YUCK, YUCK! I hate lipstick too! I rubbed it all off during the dance. DISGUSTING. But hey, I danced with a lot of boys. Random boys were asking me to dance with them. My friend said it was cos I was PRETTY. I have to admit that I liked slow dancing with the boys though. I'd have pulled off some of Shammi's awesome dance moves, but I was wearing a stupid dress. Don't like dresses. Hello, bachchoo. :) I'm glad you had fun at your first school dance. As for makeup, you may like using it (a little) when you grow a bit older. Or perhaps not. Don't knock yourself out about it. I fell off the chair laughing when you called me bachchoo. HAHAHAHAHA! The dance got me thinking though. WOULDN'T IT BE SO MUCH FUN TO DANCE WITH SHAMMI? :DDDDDDDDDD I mean, he's so good and all! I would so dance with him. Then I would slow dance with Joy Mukherjee 'cos I think he's cute. And I'd dance with Rajesh too. And Dev...? :P Well I'd just hug him and never ever let go. What happened to home school? Did grandma give up on the idea? Good to see that you had fun, and good to see that you couldn't pull off any Shammi dance moves out there - what if you had broken a bone out there? Grandma must have decided it was beyond her. :) Joking apart, I think school is definitely a better idea, no? No, she isn't in the US yet. Still in Singapore. (And I want to go back! :() But when she comes, maybe. My current school is pretty good though. And hey, Shammi's moves were awesome, and yeah... he did break a LOT of bones. But it's alright. Well worth it if it was Shammi's dance move! I've been having so much fun in school. They were talking about Elvis Presley and I was unable to stop laughing because it reminded me of Shammi. So I was just rolling on the floor laughing. And I LOVE to dance around like him sometimes. So much fun! I know what you mean! I'm like that when I return from India, and it's not as if I don't cook at home. But I still miss the sounds and smells and sights of India. Sigh. * Akeli mohe chod mat jana w/Kamal Barot - Kamal B. is not a voice I could listen to too often or too long, but her pairing with Lata is rather cute. *Dagabaaz ho banke piya w/Usha - the sisters have many great duets together, but this one is somewhat unsusual in that Usha actually gets to sing more than Lata. Sorry for the late reply. Agree with you about Kamal B. :) I like her in short doses. I like Lata-Usha duets better than I do Lata-Asha ones, I don't know why.